Endometriosis: successful treatment of pelvic pain & infertility. 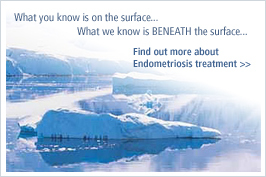 Endometriosis often acts like an "iceberg" with most of the disease under the surface. Many surgeons simply diathermy or laser the surface leaving residual disease and more symptoms. We excise the disease aiming to remove the whole of the "iceberg". This type of surgery results in substantially better outcomes and often avoids radical surgery like hysterectomy. It is now possible to freeze eggs as a form of “fertility” insurance. The technique is new and only limited results are available but the results are promising and increasing numbers of patients are looking at this alternative. For those with medical indications, such as endometriosis, a Medicare rebate is available. We perform this service in association with Sydney IVF.